School One Act plays were great. I was very much the proud mama with our Kitty being the ham she is able to be with great confidence and aplomb. It was a very fun evening with people laughing in the right spots--and no perceived forgotten lines. 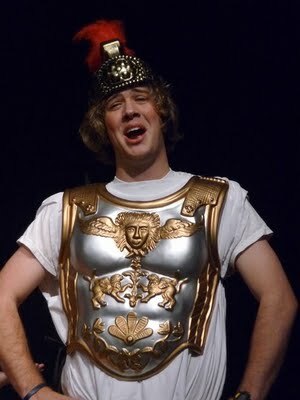 Matt P. took the audience with him with his very funny roles of a mourner in a funeral and as Medea's husband (complete in toga, black socks and shoes, plastic breastplate and helmet with a plume). Alex looked tall and elegant in his suit as one of the mourners at the funeral (in the funeral play). I decided that I would lean on lynda.com to teach InDesign to the class at the High School. We watched 5 video clips (I learned quite a bit) and was happily surprised that the students seemed to glom onto these lessons. Onward. Feeling brave, I came home to InDesign and taught myself how to port Microsoft Xcel spreadsheets into an InDesign file to dress it up and make it look more designed. Surprisingly, not hard--but not a sure bet the first time out. But, I did it and now...one more tool in the toolbox. Next step, can I format the type etc. in InDesign so when I import the file, it will be immediately formatted within the type frame? Wouldn't that be total slickness? I think so. Illustration wise I am betwixt and between. I have entered the Society of Illustrators Show in NYC, the same in LA (did I mention I am now a member?). Communications Arts I need to check the deadlines as this is a good one too. The new Creative Quarterly should be out soon--so a bunch of my stuff should be there too. I will post the link to the page of the pieces that did not get into the printed piece. I have 3 out of the 5 Hangar Theater posters done....need to get the other two : 39 Steps and The Piano Lesson done. One is typographic, the other illustration (a double portrait, I think). Got Bethnal Green done (you saw it this week) . I am also doing a bunch of little odds and ends for others who have things out there. All gratis of course. But in the cracks, I am working on an illustration of a lady riding a rooster (a partner to the little man riding the horse in the Fraktur work). I was thinking about the imagery and type that these Pennsylvania Germans use and putting the hat on of that wonderful artist , whose name escapes me, who creates these full sized vignettes of colonial people beautifully dressed in colonial garb made out of african kente cloth. He takes one idea and just twists it a bit to make it evolve to a new, fresh message. I like the idea of these little colonial people doing ordinary things...but evolving to less ordinary and more modern or whimiscal things. I like the idea of taking the birth and death, marriage and house blessings and twisting it with modern phrases and words. I like the idea of keeping a simple palette and taking the imagery to another place. Must mull on that. I am fascinated by being fifty. It seems that many of my friends and acquaintances are all changing their thinking to change their lives to do what they really want to do, to pursue their bliss, to take all that they know and love and spend time doing it. Its interesting as so many are opting for more creativity in their lives for a bit less in the paycheck. These are folks with jobs, often good paying jobs with benefits and vacations and perks....but somehow crossing fifty with many of their obligations of family winding down with kids going to college or even kids having kids, that the measure of their lives, how they spend their time, and the second career or chapter seems to be something open to them. The prospect of the new vista with more time is charging people to regard themselves, their community and their role in that community with new energy and focus. It is an interesting thing to have these boomers focus their trained brains on a new place. Life should be richer for all of us. It's pretty exciting to be on the front end of many of their thoughts, thinking and plans. I view myself as blessed. Rob is home at one. I have to order my new favorite thing for cast parties --italian subs, hold the dressing. These babies are scarfed down in short order--and all I have to do is pick them up. Another key to these treats working, -- they are cut into little 3" pieces...so its enough, but low High School waste factors. We have more play today along with a cast party. I am opening up boxes of things I have ordered for Christmas and starting to wrap. But you were the first folks on my list as I have been remiss in our chats.